When you get consensus, you find common ground and get common returns. Risks perversely rise as they do for a herd of sheep with any surprise potentially leading to a panic. Shared outcomes are fine for society but not investors. There is the rub as the BOJ delivered nothing new except for the lower inflation forecast. The belief that Japan disinflation can end with keeping policy unchanged requires a suspension of disbelief. There is madness to central bankers in thinking the same policy that hasn’t worked in the last year will do so now. The consensus for US and China trade talks continues to be one of fragile hope for a deal or delay to the March 1 deadline. Perhaps its madness to think that the IP and tech issues will be resolved quickly even as Beijing promises more stimulus today. The consensus for UK Brexit is one for a delay as Plan B is Plan A and EU pushback on Ireland continues. Perhaps its madness that GBP trades over 1.30 now with 1.34 next in play. The consensus is that the US is going into a recession in 2020 or 2021 and that the USD is going down. This despite the fact that inflation is contained, FOMC policy mistakes are less obvious with their patience talk, US inventories and oil shocks are not obviously in play – leaving the fear for trouble ahead linked to financial risks for bubbles like 2000 and 2008 with Tech and Housing. The consensus bubble is about leveraged loans and credit globally being out of whack after a decade of QE and zero rate policies. This puts the BOJ, ECB and others on the block for risk watching. For trading this consensus you merely have to watch the USD as its weakness confirms that it’s a late stage game where equities can continue to climb a wall of worry and hopes for geopolitical peace from the UK and China hold. 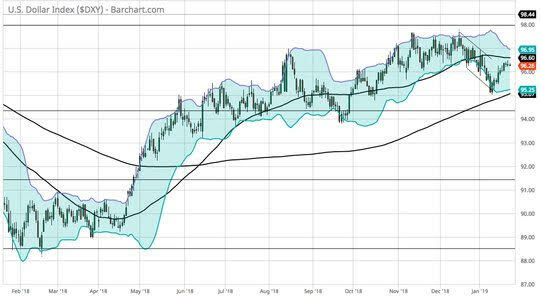 The USD star from yesterday wanes today with 95 on the index the next bear target. Watch the tiger not the sheep today. Question for the Day:Does Brexit matter anymore? There is a Brexit boredom in the US and Europe. Headlines matter less and less to markets and there is a growing sense consensus that the worst case won’t happen (hard Brexit), so all other outcomes are better. 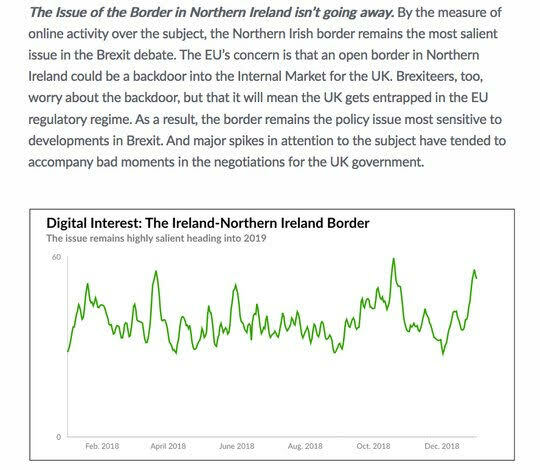 The sticky issue that remains in the news is about the Irish Border. The timeline for any resolutions to Brexit matter as it’s the ongoing seemingly infinite process – that drives down future investments and growth in the UK. There is a hard deadline of March 29 to exit the EU. The PM appears to see going back to Brussels and get more assurances over her Irish backstop as the key for Plan B.